No, this is not a regular chalkboard. These are the UDDEVALLA cover panels with blackboard surface. 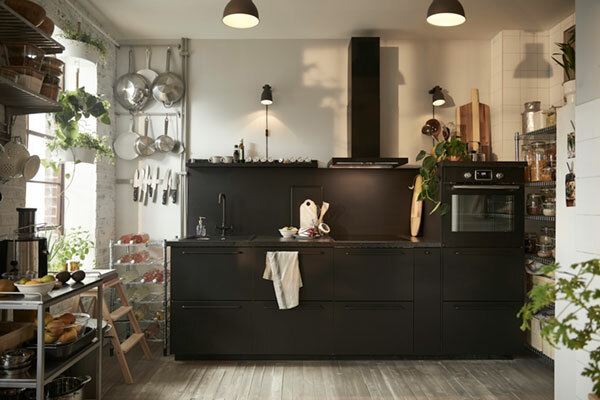 The matt black kitchen cabinet doors are great for writing - everything from recipes and to-do lists to the many activities. Even if you are a student and live in a dorm, it's possible to make your room stylish and comfortable. 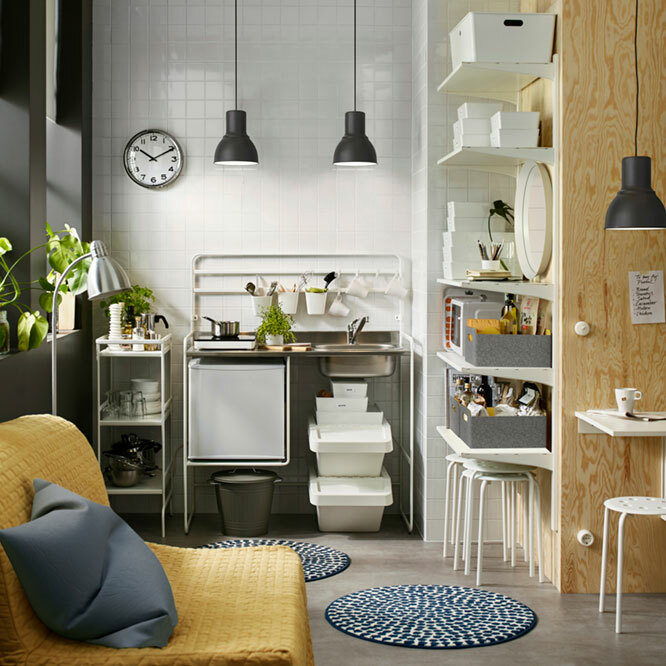 Take a look at this Scandinavian modern style dorm room where the SUNNERSTA mini-kitchen together with ALGOT storage system, open shelving units and a flexible trolley can easily serve for a whole kitchen. Step into a spacious family kitchen that is traditional in style, yet modern in function. 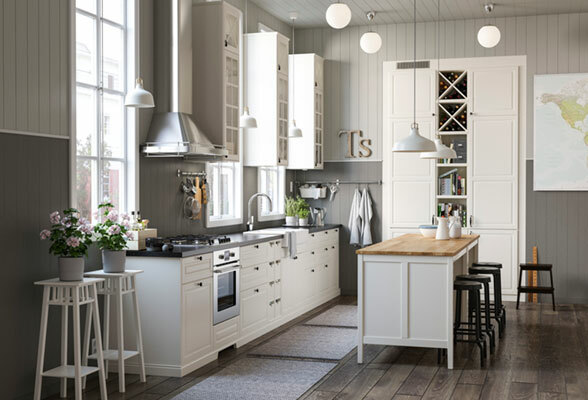 Here, you will find lots of classic furniture: from open shelves and high kitchen cabinets that provide plenty of storage for tools and food to TORNVIKEN wine shelf and kitchen island that gives you extra work space and serves for a dining table (there also are four RÅSKOG bar stools). Creamy off-white BODBYN doors give a distinct, traditional character and brings a bright, warm touch to this kitchen. The lacquered doors are smooth and seamless, resistant to moisture and staining and very easy to keep clean. Who said that kitchen furniture fits only in the kitchen? The OMAR open shelving units will also work in a corridor near the kitchen or in a pantry. Adjustable shelves make it simple for you to adjust the space to suit your needs. Also stands steady on an uneven floor due to its adjustable feet. The OMAR clip-on basket can also come in handy in the kitchen. It transforms an unused area into a practical storage space for the small things you want to have close at hand. Here’s a small modern kitchen that feels light and airy. The trick? 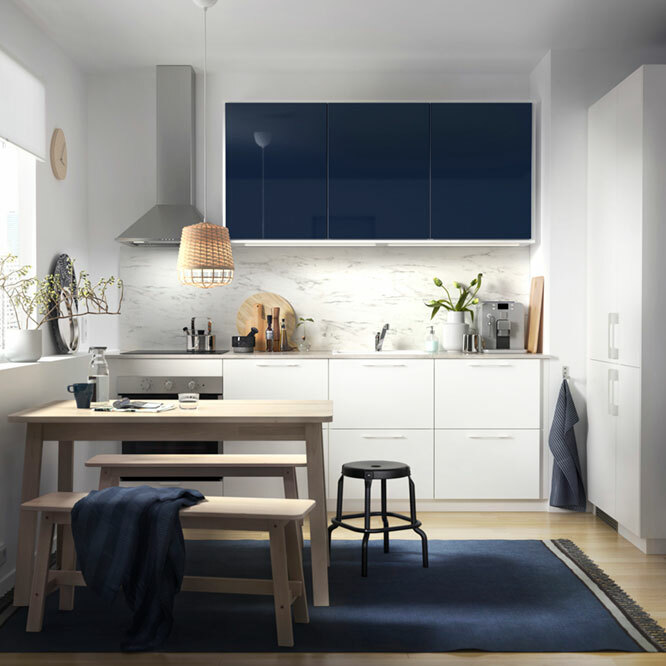 Clean lines of the RINGHULT cabinet doors, integrated appliances (like the fridge in a solitaire cabinet) and a pop of colour, thanks to the blue JÄRSTA kitchen fronts and a rug. And don't forget the NORRÅKER dining table and benches made of solid birch. Every table is unique, with varying grain pattern and natural colour shifts that are part of the charm of wood. Bring a piece of the countryside into the urban city. This family made their small kitchen into a homey space with microgreens, a tiny dining nook and white paneled HITTARP kitchen fronts and cabinet doors that has a soft off-white colour and vertical groove pattern giving a sense of traditional craftsmanship. Together with the GAMLARED dining table, they create a personal kitchen with warm country charm. 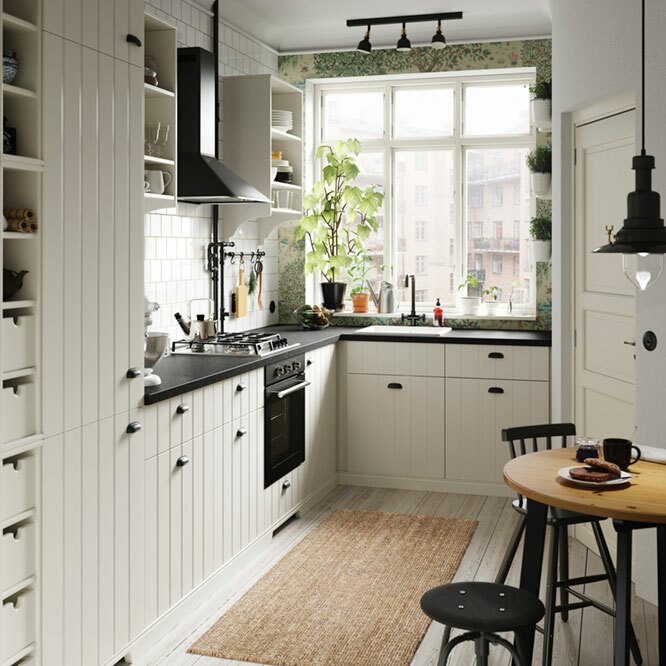 Using the ALGOT open wall upright/shelves is a great solution for modern kitchen. 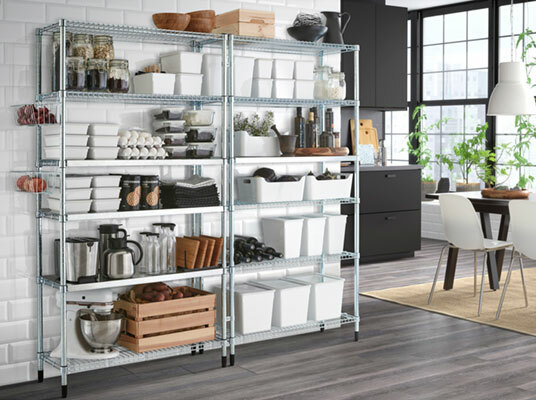 The parts in the ALGOT series can be combined in many different ways and so can easily be adapted to your kitchen's needs and space. You can have room for anything from dishes to microwave oven, ant the lower shelves serve for an additional work space. There also is plenty of room for SORTERA waste sorting bins with lids underneath. You can easily access the contents of a bin, even when stacked, because it has a folding lid. Conscious living starts with the kitchen. And in a home that’s all about preserving resources and reusing materials, even the kitchen cabinet fronts are made from recycled materials. 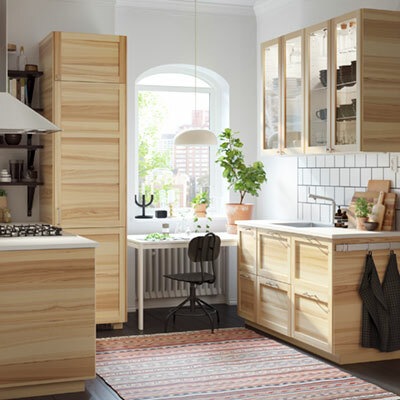 In this sustainable kitchen, the KUNGSBACKA kitchen fronts and cabinet doors take the centre stage. They are made from recycled wood and covered with a plastic foil made from recycled PET bottles. As there are no wall cabinets, the OMAR open shelves and UDDEN kitchen trolley are used for storage. This traditional style kitchen in the apartment of an elderly woman is full of smart solutions. The grey BODBYN kitchen fronts in classic design are here to bring cosiness. The U-shaped kitchen works perfectly even without closed wall cabinets. Instead of them, we have the BOTKYRKA wall shelves that make it easy for you to see and reach the things you use every day. The INGATORP drop-leaf table comes in handy when you are waiting for guests. This dining table adjusts according to need and can seat 2-4 persons. 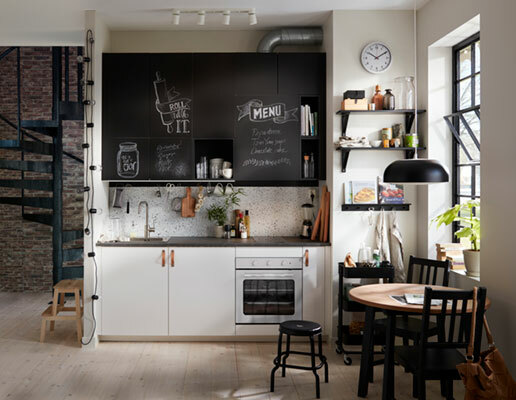 This modern style kitchen in old town apartment belongs to a family with children. Their RINGHULT kitchen fronts have clean, straight lines and a glossy surface that is durable and easy to keep clean. 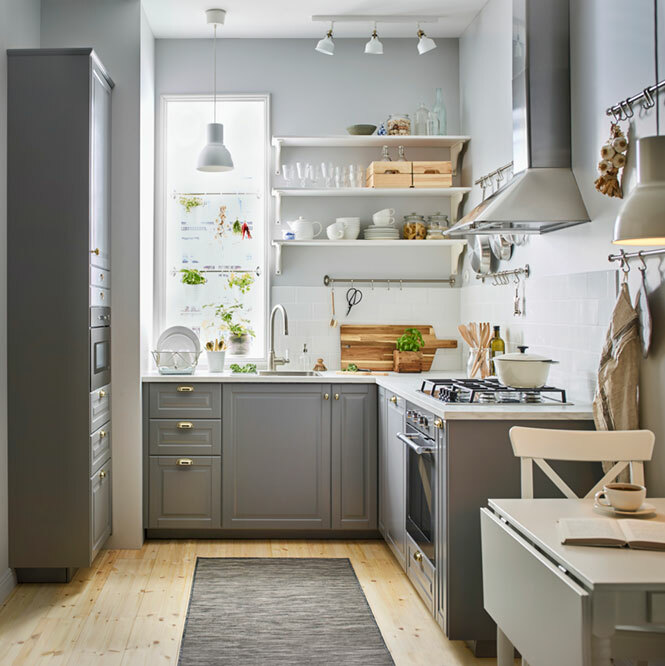 The KUNGSFORS suspension rail with open shelves is strong enough to hold their dishes, heavy pots and pans, as well as cooking tools. A free-standing kitchen island gives you extra storage, utility and work space. And the SKOGSÅ worktop with a top layer of oak is makes this kitchen even more beautiful. Every worktop is unique, with varying grain pattern and natural colour shifts that are part of the charm of wood. 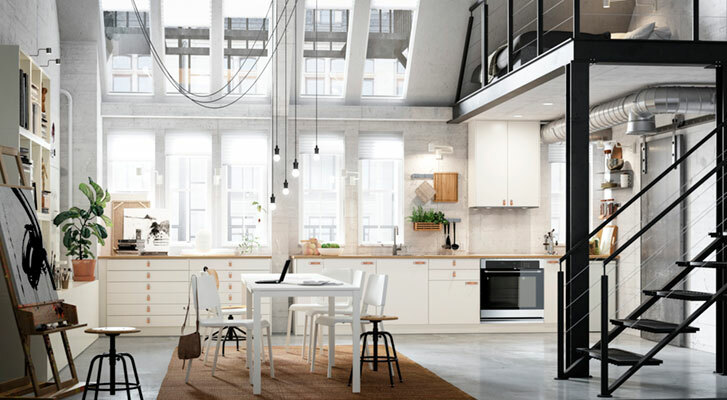 If you want your modern kitchen to blend in and become one with your living space, use neutral VEDDINGE kitchen fronts and cabinet doors – they’re the perfect backdrop for letting other things and furniture pop out and get all the attention. In this kitchen, you will see only one hanging cabinet with a hidden extractor hood. The other kitchen cabinets and chests of drawers stand on the floor. They occupy the entire length of the room. And the most frequently used kitchen tools and accessories can be hung on the RIMFORSA rail with hooks. 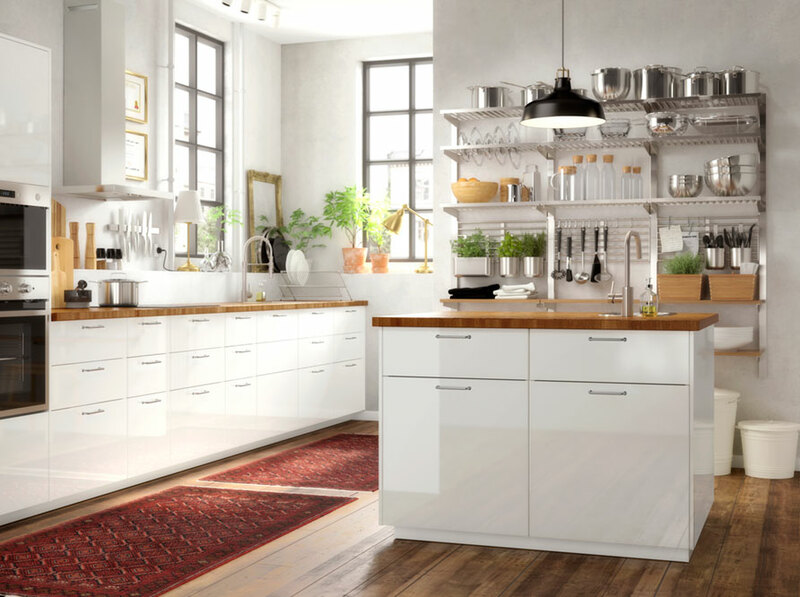 For those who prefer a natural handmade look, we recommend the traditional style TORHAMN kitchen fronts and cabinet doors. Each cover panel is unique, with varying grain patterns and shifts in colour that highlight the natural charm of wood. It brings the feeling of quality and handmade craftsmanship to your kitchen. With the MELLTORP table frame in white, you can find the expression that looks the best in your dining area or small home office – choose a table top in white marble or ash.